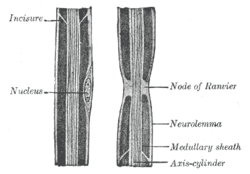 Diagram of longitudinal sections of medullated nerve fibers. Medullated nerve fibers stained with silver nitrate. 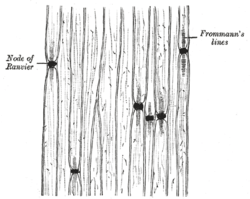 An internodal segment (or internode) is the portion of a nerve fiber between two Nodes of Ranvier. The neurolemma or primitive sheath is not interrupted at the nodes, but passes over them as a continuous membrane. This article is issued from Wikipedia - version of the 6/9/2015. The text is available under the Creative Commons Attribution/Share Alike but additional terms may apply for the media files.